The development of medical training is of course closely related to the development of faculties of medicine. Uppsala University was granted the right to offer education by Pope Sixtus IV in 1477, which also included medicine. Instruction did not commence, however, until 1595, when a professorship was established in medicine (physiology = the study of nature). The chair was not filled until 1613, however. Before that, King Johan III had sent Benedictus Olai, his court physician, to Uppsala to teach. 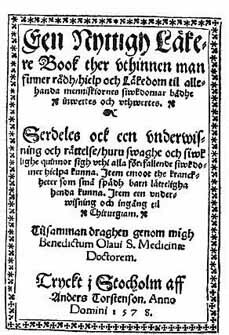 Apparently not much came of that teaching, but Olai did publish the first medical book in Swedish in 1578: “Een nyttigh läkare-bok”; (A Useful Medical Book). Olai had a Dutch colleague, Vilhelm Lemnius, who was called by King Erik XIV to serve in Sweden. What is interesting about him is that he was a precursor to Linnaeus in certain respects. In the work “Emmoot pestilentzie, huru hwar och een menniska sigh hålla skal” (Against pestilence, how each and every person should be prepared) (1572), Lemnius gives instructions for the use of domestic medicinal plants: …“how each of us should be able to fetch and prepare our own medicine from spice gardens or out in the countryside.” The book also offers advice about how to protect yourself from pestilence through hygiene and suitable diet, and it points out the importance of contagion. Lemnius also wrote a proposal for measures to elevate and organize medical science in Sweden. Seen from the point of view of Linnaeus’ work, this is an interesting document that recommends that an itinerant botanist should be employed to gather domestic medicinal plants and keep them accessible. Further, it states that a pricelist should be posted for medicines sold at pharmacies, that a spacious and well-ventilated hospital should be constructed by the state, that something should be done about medical quackery, and that inspections of pharmacies should be undertaken. Wilhelmus Lemnius was a precursor in some respects to Linnaeus as a physician. Benedictus Olai wrote the first Swedish textbook in medicine (1578). Source: Wilhelmus Lemnius och Benedictus Olai. 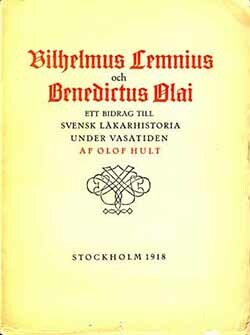 Ett bidrag till svensk läkarhistoria under vasatiden (A contribution to the history of Swedish medicine in the Vasa age) by Olof Hult, Bröderna Lagerström, Stockholm 1918. Later in the 17th century a second professorship was established, specializing in practical medicine. It was prescribed that teaching should be shared in such a way that one of the professors lectured on theoretical and practical medicine and the other on physics, botany, and anatomy. This division was still in place in the 1740s when Linnaeus and Rosén were appointed professors of medicine. With the exception of a few brief periods, medical training was neglected from the time the subject was established until Linnaeus and Rosén took charge of instruction. Teaching in practical doctoring took place during the professor’s visits to patients’ homes. In Uppsala a hospital, Nosocomium, was established in 1717 on Riddartorget (Nobility Square), where instruction could take place. But resources were poor, and the number of beds in 1740 was only 16–18. 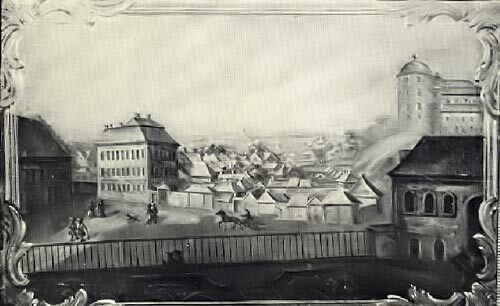 Nosocomium – Bengt Oxenstierna’s house on Riddartorget (the building to the left in the picture) opened as a clinic in 1717. The illustration is from an 18th-century painting. Source: Akademiska sjukhuset 1867–1967 En bildkrönika (Uppsala University Hospital 1867–1967 An illustrated chronicle) by Åke Davidsson, Almquist&Wiksell, Stockholm, 1967.